One last meal with my sister Hong before she heads off to Berlin for a new job. At her request we hightail it over to Cong Ly for a quick bowl of Hu Tieu My Tho, squeezed in-between last minute errands and an afternoon flight at Newark. In the same amount of time it would take you to order and consume a Macdonald's Big Mac, we had a hot and healthy bowl of noodle soup. 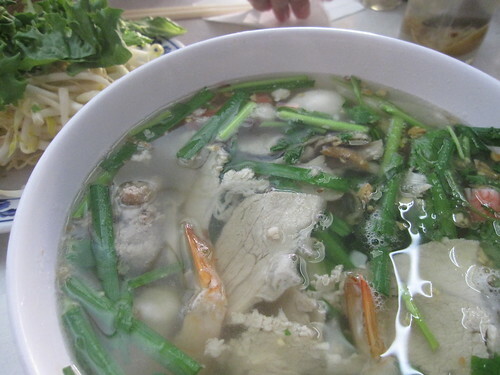 Hu Tieu is particularly wonderful for its light broth, diversity of toppings and the celery. Gotta love crunchy celery bits in soup.